Former Ontario PC leader John Tory and former TTC chair Karen Stintz officially entered the Toronto mayoralty race Monday. Former Ontario PC leader John Tory and Coun. Karen Stintz have officially added their names to the list of people who will be seeking Rob Ford’s job as mayor this fall. Both Stintz and Tory arrived at city hall Monday morning to fill in their nomination papers before a crowd of reporters and cameras. Both offered few details about their platforms, speaking instead about a general need for leadership change at city hall. Tory arrived at city hall just after 8:30 a.m. ET. After filling out his forms, he spoke briefly with reporters about his campaign, which will be his second run at the mayor's chair after a failed attempt to beat David Miller in 2003. The former Rogers Media chief executive and Canadian Football League commissioner said he wants to run "a positive campaign about the future of the city." "Right now, we're at a time when we need to get the whole city working together, the whole council working together to make it accountable, to make it affordable, to make it functional," he said. Stintz arrived at city hall 90 minutes after Tory. Her appearance before the cameras didn't go as smoothly. She approached the counter and didn't have identification when the clerk asked for it. Shortly after, someone retrieved her ID, and she filled out the required forms. Like Tory, Stintz also spoke in general terms about her campaign platform. She said alleviating traffic congestion, keeping taxes low, improving transit and preparing Toronto for a bid to host the World Cup are her priorities. "It's a long campaign, and I'm looking forward to it," she said. "I look forward to a campaign that is fiscally responsible but also delivers on the priorities of this city." Tory said he was committed to low taxes and a new north-south subway line to ease pressure on the crowded Yonge-University-Spadina line. For Tory, the formal announcement of his candidacy comes after a long period of speculation that he would take the plunge. For the past four years, he has hosted a radio show on a Toronto radio station. He took up the radio gig a few months after resigning his position as the Progressive Conservative leader in 2009. Tory also has political experience dating back to the Ontario government led by former premier Bill Davis. He worked as the then-premier’s principal secretary for five years in the 1980s. Stintz, the three-term councillor for Ward 16 Eglinton-Lawrence, had previously said that she would pursue a mayoral bid. She held off entering the race formally until council named a replacement for her as Toronto Transit Commission chair. The emergence of Tory and Stintz as mayoral contenders brings into sharper focus the field of candidates who will be vying for the mayor’s job on Oct. 27. Trinity-Spadina MP Olivia Chow has said she is considering a bid herself, as has Coun. Denzil Minnan-Wong. But neither has announced a final decision on the matter or filed papers thus far. 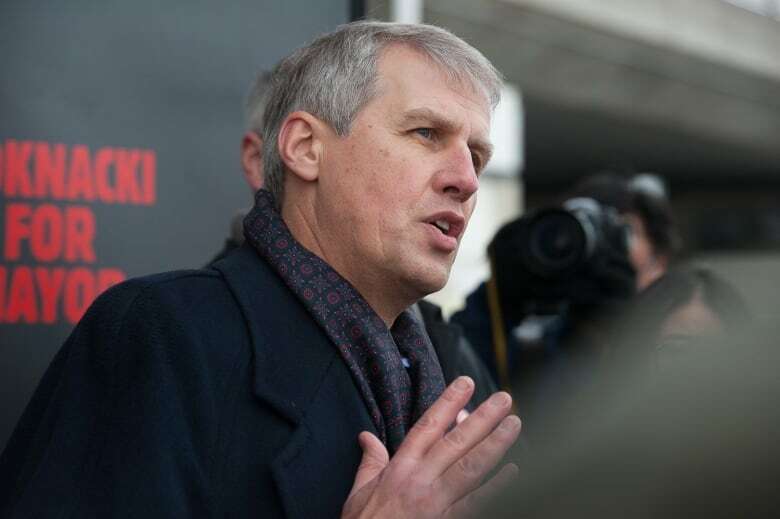 Two former city councillors, David Soknacki and Norm Gardner, had already filed papers in January, along with more than two dozen other candidates, including Ford himself. Soknacki, a former city budget chief, announced his intent to run long before he registered to do so in January. On transit, the mayoral candidate has so far said that he believes the city should be building light-rail in Scarborough, rather than a more costly subway expansion project that council approved last year. On Monday, Soknacki issued a news release welcoming both Stintz and Tory into the mayoral race and inviting them "to engage in a campaign of ideas for the future of Toronto." In an accompanying statement, Soknacki said: "I’m not a celebrity, but I am the only fiscally responsible candidate who is in this for the people of Toronto. This city deserves new leadership and smart, practical ideas that will benefit every part of Toronto. The time for drama is over." The addition of Stintz and Tory — both fiscal conservatives — creates an increasingly crowded field of candidates on the right. Stintz said she was concerned that could help return a left-leaning mayor to city hall. "I am worried that we could end up with a pendulum swing back toward an NDP government, and I don't want that. I think we had seven years of that and the city spoke against that." When asked if she would pull out of the race to allow another conservative candidate to win, Stintz said she plans to stay on the ballot until voting day. Rob Ford registered to run for re-election on Jan. 2, the first day it was possible for him to do so. The incumbent mayor has long said he relishes the opportunity to debate his opponents. He has also predicted that the campaign is going to be "a bloodbath." Ford appeared on Newstalk 1010 shortly after Stintz spoke to reporters. He said he's not worried about either candidate, and touted his record in office. "The city is 10 times better off than it was three years ago," he said. "I'll put my record up against anyone. I've brought accountability to city hall." 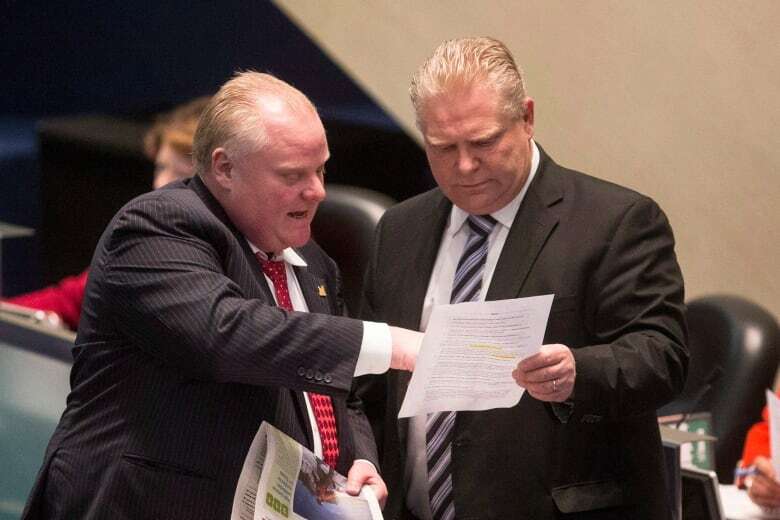 Ford was asked about his turbulent 2013 in office, in which he admitted to smoking crack cocaine and appeared ranting and inebriated in two widely circulated videos. "I wasn't elected to be perfect," said Ford. "I was elected to straighten out city hall."